When planning a survival garden, you can’t just focus on the number of plants you can grow–you also have to think about the nutritional value of those plants. Most survival food isn’t very nutritious due to all the processing and preservatives, so it’s a good idea to supplement your stockpile with healthy produce from your garden. Not celery, cucumbers, and other plants that are mostly water, but veggies that are packed with vitamins and essential minerals. This is an easy one to grow in almost any climate. It is packed full of vitamins, including a variety of B’s as well as calcium and fiber. An excellent choice that can grow in any zone. Spinach is very high in iron. You can continuously harvest from a single plant for several weeks or more, ensuring you always have fresh spinach. Similar to spinach, but it is considered to be superior in nutritional value. It is one of those superfoods you hear a lot about. It is high in iron, which can help stave off anemia. Being anemic at a time when there will be a lot of physical demands on your body is not a good idea. These are one of the few root crops that pack a lot of nutrition. And bonus, you can eat the beets as well as the greens on top. Beets are rich in vitamin C, iron and potassium. The leafy greens, which are great in a salad, are high in calcium and magnesium. Think muscle and bone health. These are a healthier choice than a standard potato. They are more nutrient-rich and can be prepared in a variety of ways to help keep things exciting. Sweet potatoes are rich in vitamin A and manganese. These are a staple in the garden for good reason. They are rich in lycopene which is important to good heart health. Tomatoes can also help lower blood pressure naturally. This will be crucial at a time when western medicine may not be available. Another one of those easy and prolific veggies that are high in nutrients. If you can, go with beans like kidney or navy beans. These have high fiber content and can be dried and stored for years. A must, and everyone knows they are great for eye health. That is because they are rich in beta-carotene as well as vitamin K.
This is often overlooked because it is rather dull in color and we know dark greens and bright reds mean nutrition. Despite lacking in color, it is rich in vitamin C and manganese. It is a healthy alternative to mashed potatoes and can even be used in cooking to replace rice in some dishes. A special addition to the garden because it is good for you and it can actually heal you. It is nature’s answer to an antibiotic. It blends so well with tomatoes, you will definitely want it in your garden. What you need if you tend to have high cholesterol. It has properties that help lower the bad cholesterol levels. Cabbage is rich in phosphorous and vitamin K. Red cabbage is better for you than green, but both have excellent health benefits. 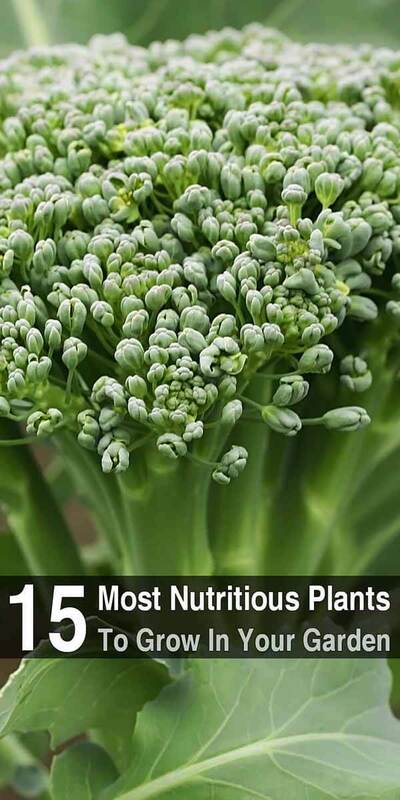 Any variety is great, and they are easy to grow and can be eaten raw or cooked. They are prolific producers and you will have plenty to store from your garden. Peas are rich in fiber, magnesium, iron, and vitamin A. These require a long growing season and plenty of warmth, but if you can grow them, do it. They are rich in potassium and riboflavin as well as a variety of vitamins. Yes, you can grow them in your garden. They are a root crop that is most beneficial as fuel for your body. A single plant can give you up to 150 pods. Peanuts are extremely versatile, but they do require a long growing season. An excellent way to get protein in your diet when fresh meat is not available. They are also high in vitamin C and can help keep you healthy in general. As you plan your garden this year, focus more on the plants that will give you lots of vitamins and minerals and less on space hogs that don’t do a lot for you. Learn how to grow these vegetables now so you’ll be an old pro when your life depends on it.